French Emblems: Emblem: Quod in te est, prome. Quod in te est, prome. Show what you’ve got [lit. bring forth what is in you]. Et vitam Soboli das Pelecane tuae. Ingenii in lucem semina prode tui. 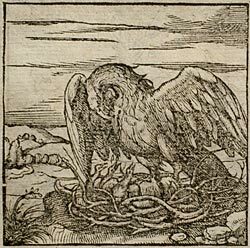 Dig deep into the hidden folds of your breast and search them out, And, like the Pelican, you will give life to your offspring. Examine your heart, search what lies within yourself: Bring the seeds of your talents out into the light. tiarum limine peregrinus ille sit, claudere velle. talibus foecundissimi ingenii fructibus fruitura. The pelican, which on account of the size of its beak the anonymous author of the Koiranidai [Coeranidae] calls ‘Rhamphios’, is (he relates) a bird peculiar to the swamps of Egypt, and most loving of its young: for though it punishes the impudence and disrespect of its chicks by death (as they deserve), it soon repents of the deed, and piercing its side, feeds its own lifeblood to its chicks to bring them to life again. This is recorded not only by Isidore of Seville but by St. Jerome, though they do not give the same credence to it: seeing that they say that this act of duty is fulfilled when the chicks have been killed by snakes, while the former refers this to an injury dealt to the parent. Nothing is more appropriate for an intelligent and learned man than, eschewing all deception, to keep nothing hidden that can be of use or advantage; and so to profit himself and his works, that he may not seem to want to dam the outpouring of any beneficence from his breast, unless he be an absolute stranger to the door of the Graces. Callimachus is witness that Hecale kept her house ‘not barred to hospitality’; the house of Cimon the Athenian was open to his Lacians; the doors of the Muses were proverbially known always to be open. The man who is steeped in both letters and the liberal arts finds what he should diligently strive to emulate as much in the one place as in the other: so that, far from being altruistic in private, he should be of service [p.79] in public, so that he is of assistance to the Republic of letters, to his fatherland, his friends, and good men in general. And so he searches for the secrets inside himself, hides nothing, and those gifts of intelligence, which are bestowed upon individuals by God the most bountiful giver for multifarious purposes, he does not only not suppress, but he brings them out into the clear light of day and, in fine, pours himself out wholly. You show yourself to be such a man to your native country, Hopperus, chief of the justices; such your friends acknowledge you, such the Republic of Letters feels you to be: and if the round of labours, each one bound to the next, that frustrate the leisure that is sacred to the Muses, had not caught you up in the worries of Princes, it [i.e. the Republic of Letters] should feel itself more richly destined to enjoy the immortal fruits of your most fertile intelligence. The explanation of the picture is too well known to need me to waste words spelling it out. 1. Joachim Hoppers: chief justice and royal counsellor to Philip II in the Netherlands. He wrote historically important notes on religious disputes in Holland and several legal commentaries. He also prepared the first historical map of the Netherlands (d. 1576). 2. Hecale, whom Callimachus celebrated in a poem, was a poor old woman who gave kind hospitality to Theseus. 3. Laciadae were men of the demos or district of Lacia in Attica. Cimon the Athenian was a statesman and general, notoriously lavish and hospitible, with an open house to all. 4. Otium has classically (esp. in Cicero) a more positive connotation than simply ‘leisure’ or ‘free time’, and signifies a dignified freedom from business that gives time and space e.g. for artistic endeavour.